When decontaminating a house laced with fentanyl where a dose equal to two or three grains of salt could kill, there is no room for error, says the co-owner of Trauma Scene Bio Services Inc.
“Two grains of salt could possibly kill you, three for sure will,” Mike Wiebe, whose company has specialized in cleaning up crime scenes across Alberta for 14 years, said Thursday. As the abuse of powerful synthetic opioids continues to rise, with 2,267 opioid-related emergency medical calls across the province and 343 fentanyl-linked overdose deaths in Alberta in 2016, so too are calls for decontaminating the places these drugs are manufactured, distributed and used, Wiebe said. His company went from zero fentanyl calls to having done nearly a half-dozen properties and a dozen vehicle decontaminations since December, he said. 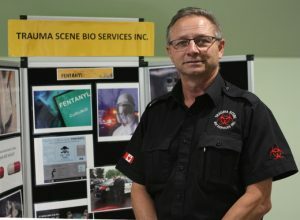 His team can usually remediate even the most gruesome scene of a homicide, suicide or meth lab within a day, but one three-bedroom apartment in south Edmonton contaminated with fentanyl took a team of trained technicians four full days to remediate, he said. “It’s very thorough; it’s horribly time-consuming,” Wiebe said. The team establishes three zones. The “red zone” is the contaminated area, a “yellow zone” is where workers change in and out of their personal protective equipment and anything taken from inside the contaminated area is washed, and the “green zone” is free from contaminants. “There is someone always outside of the contaminated area, because if someone goes down, you need someone in there to be able to get them out and apply naloxone,” said Wiebe. Naloxone is an opioid antidote that blocks the effects of an overdose in an emergency. Before entering, technicians don full personal protection, respirators and two layers of gloves, taping the seams to ensure nothing is exposed. Workers then soak everything inside the contaminated home with an encapsulating solution — the same solution they use for cleaning blood from walls — trapping any particles and preventing the fentanyl from becoming airborne. Anything porous is bagged and removed. The bags are taken from the contaminated zone and washed down before being transported to a designated biohazardous waste dump site. Nothing leaves the yellow zone without being decontaminated first, Wiebe said. The team then begins washing every hard surface three times in a process proven to remove every trace of fentanyl, Wiebe said. They scrub everything, including the insides of light fixtures and the crevices of electrical sockets. Anything Wiebe can’t guarantee is decontaminated is ripped from the home, as even the smallest trace poses potentially serious risk. Wiebe sees a side of the opioid crisis many never will, and said he gets a sense of satisfaction knowing he has helped a family who has lost a loved one to an overdose who is also facing losing their home to contamination put their lives back together. That, Wiebe said, is worth the risk.